Getting your CDL in the state of New York - watch this video to learn air brakes! Talking to you today about air brakes in the state of New York for the purpose of getting a CDL - a commercial driver's license. I had a comment from Nad, he was having some difficulty understanding air brakes and that's little doubt in terms of getting a driver's license. The air brakes is the most technical and the most difficult for students to understand. There's a lot of information that you need to know and the state of New York, like many other jurisdictions—here in British Columbia, Alberta, Ontario—are still teaching a forty-year-old airbrake course. And just in case, they stick everything & the kitchen sink into these air brake courses. And it serves to simply confuse students. So today, what we're going to do, is we're going to go through the air brake chapter for the CDL manual in the state of New York. And highlight some of the information - give you some further information and tell you stuff that you're just not going to find on an air brake system anymore. First and foremost, for air brakes what you need to understand is is that air brakes are no different than the brakes on your regular car or light truck. The only difference between air brakes and the brakes on your car or light truck is the power source. On a light truck they're hydraulic brakes, which means that there's hydraulic fluid in there and the pressure created from the pump, which is basically the brake pedal—the master cylinder—pushes and the brake shoes inside the hub push out against the hub and bring the vehicle to a stop. 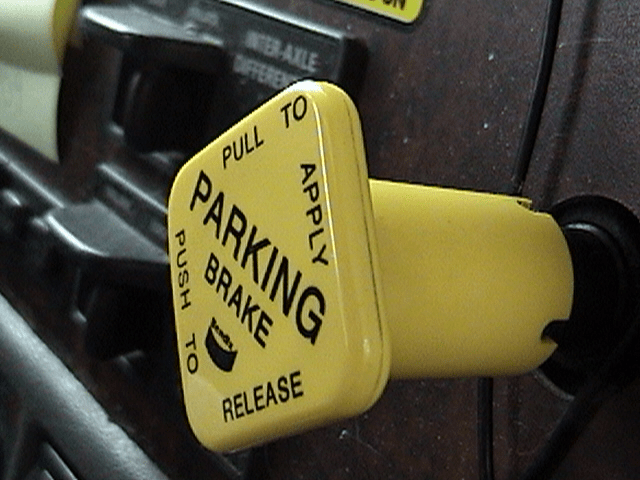 Parking brakes on your light truck or vehicle - pull up on the handle. It's a ratchet. You use mechanical power from your body to pull that up or you push down with your foot on the floor and it locks in. Its a ratchet set - you know kind of like on a boat winch - click, click, click. The parking brake on your vehicle is exactly the same thing. On an air brake system, instead of using hydraulic power, we're using air pressure, which applies the brakes going up and down the road, which we commonly refer to as service brakes. And the parking brakes on a big truck or a bus are applied with spring pressure, which is the mechanical force that we use to apply the brakes indefinitely. Before spring brakes were applied in the late-1960s and early-1970s, a few trailers rolled away, careened down a hill, and killed a porta potty. So authorities deemed it necessary that brakes on big trucks and buses needed to be applied indefinitely when the vehicle was left parked. As well, the spring brakes will act as an emergency brake if air pressure in the system drops to unacceptable levels - below 60 pounds per square inch. So today we're going to talk to you about air brakes in New York State. Today we're going to go through the manual and we're going to highlight information for you. I'm on chapter 5 of the CDL manual in the state of New York. The first section talks about air brakes and why we use air brakes on large commercial vehicles. First and foremost, these have proven reliable for more than a century now and are capable of stopping large commercial vehicles and transmitting powerful force over a large distance. So think of a large tractor-trailer unit that's almost 75 feet long. The driver can control the brakes from the brake pedal in the cab all the way back to the back of the trailer almost 70 feet away, and we have braking force. As well air brakes are tolerant to leaks and when I say tolerant to leaks, air brake systems—modern air brake systems—are tolerant to fairly large leaks. You can even hear a leak in the cab while you're driving down the road with all the road noise in the diesel engine because all of the air from the air brake system is plumbed through the dash. And you'll be able to hear it long before that low air warning comes on! Unless you're drunk, stoned, and asleep, you are going to hear that air leaking out of that system. 3) emergency brakes in the event of a power loss. 3) emergency brakes and parking brakes and emergency brakes are one and the same thing. Large, powerful springs that are held off going up and down the road with air pressure. If air pressure is lost, the springs start to come on and the spring brakes will act as emergency brakes. So those are the three kinds of brakes that they're talking about at the beginning of the chapter in chapter 5 of the New York CDL manual. The next piece is the air compressor. The two pieces that you need to highlight for the air compressor is that it's gear-driven or belt driven. Believe me, these air compressors haven't been belt driven since the nineteen seventies, but it is a question on the test whether they can be belt driven or gear driven. All compressors in this day and age are bolted right to the side of the engine. They use the air intake from the engine's filtration system. They also use the engines lubricating system. They don't have their own oil supply. I mean unless it's from the nineteen seventies - yeah. The air compressor is gear-driven, air cooled, & uses the engine's filtration system to bring in air and uses the engine lubrication system. I'll put up a card here for you for the full video on an air compressor. The next piece is the governor. The governor controls the compressor. In the state of New York, governor cut-out pressure is a hundred and twenty-five pounds and cut-in pressure is a hundred pounds per square inch. You need to test whether the governor's working - minimum and maximum pressure. And I'll put a card up here for you for the full video on the governor. One thing I will say about the governor: it works like a thermostat on a furnace. When the temperature in your house goes down to a minimum, the thermostat turns the furnace back on; when the temperature goes back up to a maximum, the thermostat turns the furnace off. A governor in an airbrake system works exactly the same. The only difference is that the compressor runs the entire time that the engine is running. So instead of turning it off and on, all it does is is load or unload - it cuts it in or cuts it out. When it cuts out, its pumping air into the atmosphere and sitting there and just kind of chug, chug, chug... cooling off. It's like an internal combustion engine without the spark plugs. And it's just kind of there and cooling off and not really doing anything. Cut in - its pumping air into the system. That's the job of the governor - minimum maximum for the governor. And like I said, there's a full video on the governor here on the channel. Next piece on the air brake system are the air tanks. The air tanks are the first failsafe of the airbrake system. There's enough air stored in the air tanks for 10 to 12 full brake applications. Now what you need to know about the air tanks—sometimes called reservoirs—just call them air tanks is they all have drain valves on them. For the purposes of the air brake test we drain the air tanks daily, daily, daily. Because hot air comes out of the compressor. It cools inside the tanks, and when it cools you get moisture inside the tanks. Think of it like a drink with ice cubes in it in the summertime. The glass is cold & the hot air comes in contact with the glass. And what happens is the water vapor inside the air condenses into a liquid and forms water droplets on the outside of the glass. That's exactly what happens inside an air tank when the hot air from the compressor goes into the air tank. Thus they have to be drained every day. Most air tanks will have manual drain valve on them. It's either going to be a pull cord or it's going to be a stopcock. The next piece is the alcohol evaporator. It's unlikely that in the state of New York or anywhere else in the United States—even the lower 48—maybe in Alaska, but you are not going to find an alcohol evaporator on a modern truck. Unless it's working in sub-zero temperatures, they're just not going to have alcohol evaporators. 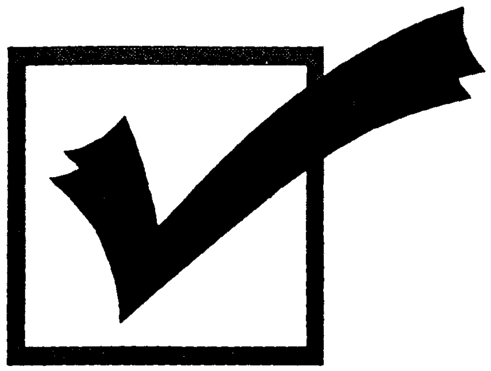 However for the purpose of the test, the question that you need to know about alcohol evaporators - you need to use manufacturer-approved methyl hydrate in the alcohol evaporator on the air brake system. Essentially what these things do is you put methyl hydrate into the alcohol evaporator & it lowers the freezing point of water and reduces the chances of any vapor or water inside the airbrake system causing it to freeze up. Like I said, not likely you're going to see one unless you're working in Alaska or in northern parts of Canada. Most air brake systems are just not equipped with alcohol evaporators. All tanks are equipped with a safety valve to release pressure or vacuum if it gets too high. For the purposes of an airbrake system, the safety valve will blow off a hundred fifty pounds per square inch. The safety valve blows off and sounds like a machine gun [MACHINE GUN SOUND] and you'll know it's the safety valve blowing off. When that happens you can take the vehicle into your mechanic and authoritatively say, "there's something wrong with the governor or the compressor." Most likely the governor. Brake pedal on a large commercial vehicle controls the service brakes. Make sure that you have the parking brakes released before you apply the service brake - or the brake pedal. Because you don't want to compound the brakes. All modern air brake systems are equipped with anit-compounding valves, which will release air pressure and will not allow the service brakes to be applied when the spring brakes are on. However, for purposes of a road test—the purposes of a air brake tests—do not compound the brakes. So make sure that you have the parking brakes released. The yellow and the red button pushed in before you put your foot on the service brake. Service brake is essentially the same as a hydraulic brake - it does have back pressure. It will feel a little bit different and depending on what truck or bus you get into some are going to come on automatically and some are not. The harder you push down on. the more air pressure you apply to the brakes - the greater the brake application. Most brake applications, for the purposes of driving, normal driving, are going to be made at less than 10 pounds per square. Very little air pressure required to apply air brakes on a large commercial vehicles. The brake pedal on a large commercial vehicle—an air brake equipped vehicle—works the same as the brake pedal on your car. You push down on the brake pedal and the brakes are applied; you release the brake and the brakes release. One of the differences is that in an air brake equipped vehicle you're going to get some brake lag from the time that you put your foot on the brake to the time that the brakes actually apply. There's going to be a slight delay - not really noticeable, but in the beginning it's going to be a little bit weird. As well, there's also a brake lag from the time that you release the brake to the time that the brakes actually release. So know that there's a term called brake lag and you're probably going to get tested on that for the purposes of your air brake test. The other difference in an air brake equipped vehicle is that if you pump the brakes going downhill, after you make a service brake application the air that you use to make a brake application is evacuated from the system through the quick release valve. It reduces brake lag in the system by evacuating the air. And as well, air can only go one way in the line, so we can't bring it back into the system - we simply evacuate it into the atmosphere. So know that if you pump the brakes going down hill, you're going to lower the air pressure and you may run out of air pressure and not have enough air pressure to apply the brakes once you get to the bottom of the hill. Proper braking technique in an air brake equipped vehicle - hard, short, intermittent brake applications. So hard brake applications - bring your road speed down five miles per hour, let it run back up - hard, short, brake application. This way you won't fan the brakes, you won't lose air in the air brake system and it's the proper braking in combination with engine brake technology. If you are in the right gear and going down the hill in the right gear and see the video here on proper downhill braking in modern air brake equipped vehicles. You shouldn't have to use the service brakes at all, however if you do have to use the service brakes - hard, short, intermittent brake applications. Bring the road speed down five miles per hour and let it run back up again. Hard, short, brake applications - this way you won't run out of air and you won't overheat the brakes and create brake fade - brake fade is when you overheat the brakes and the shoes won't come in contact with the drum. I'll put a card up here for you on brake fade. Every system, regardless of whether it's hydraulic system or whether it's an airbrake system, suffer from the weakness of brake fade. So make sure that you don't get brake fade in this day and age. And there's no reason why you should with modern engine brake technology. These are the four types of foundation breaks. 'S' cam or drum brakes are the most popular. It's a drum and inside the drum are shoes. And the shoes push out against the drums creating friction and heat and bring the vehicle to a stop. These are the most common. Disc brakes are better because they don't suffer from brake fade, however the technology is not quite there yet for large commercial vehicles. Disc brakes are beginning to make inroads into air brake systems and large commercial vehicles, but technology is still in its beginning stages. And unfortunately, the technology is not advanced enough to absorb the sheer amount of heat that is generated in large commercial vehicles. So what happens is that if there's too much heat put to the disc brakes it melts into a big pile of goo and your vehicle careens down the hill and you crash into a tree and die in a firey inferno. So not really there yet, but it's coming. And the advantage of disc brakes is that they don't suffer from brake fade in the way that drum brakes do. Essentially it's just a 'C' clamp over a rotor, as you can see here in the image. And essentially what happens when you heat the brakes up is that the rotor heats up and it actually expands into the brake shoes. This is why we use them on sports cars and high-end motorcycles because disc brakes actually work better when you heat them up. Air-over-hydraulic was essentially a product of gas engines in the nineteen seventies. Gas engines created vacuum and they were able to use that vacuum to create air-over-hydraulic brakes. If you have a vehicle that is air-over-hydraulic brakes, you will need an air brake ticket and essentially what they've done is they've taken a brake chamber & attached it to a master cylinder and come up with a hybrid system. So that's air-over-hydraulic. The last one is wedge brakes and you'll know wedge brakes because instead of the brake chamber being perpendicular to the foundation brake, it will be pointed into the foundation brake assembly. Wedge brakes not very common. In all the years that I've been teaching air brakes and around big trucks, I have only seen one set of wedge brakes - one time. The question on the test for the purposes of air brakes and wedge brakes: it may have one or two air brake chambers. The last thing I'll say about disc brakes and wedge brakes is that they are both self-adjusting and the driver cannot adjust them. They have to be adjusted by a qualified mechanic. Supply pressure gauges - all air brake equipped vehicles have pressure gauges to tell you how much pressure is in the air tanks. The question on the test is what do the air pressure gauges tell you? They tell you how much pressure you have available for a service brake application. In the manual they call them supply pressure gauges. The pressure gauges can be to 2 gauges with one needle or one gauge with two needles. If they're one gauge with two needles one will be green, one will be orange for the most part. After time they get faded and they kind of go more to white as opposed to pink. Application pressure gauge tells you how much air pressure you're putting to the brakes while you're applying the service brake. Application pressure gauge - it's a great learning tool for new students, but for most drivers you're not going to be looking at the application pressure gauge while you're going up and down the road. It's kind of like some of the new sports cars that have G-force gauges in them. You're not going to be looking at the G-force gauge while you're going around a corner. Hopefully you're looking in the direction that you want to go. Same with the application pressure gauge - good for training, not so good when you're going up and down the road. In the state of New York, the low air pressure warning has to come on at 60 psi or above. Now its visual and audible. All modern air brake systems have a light and a buzzer. There are some in the old days that had a wig-wag. And you can see it here in the image. It was just up behind the visor. It was this wig-wag thing that dropped down below you. The air pressure dropped below 60 pounds. It didn't really work out so well because the thing drop down in front of a couple of drivers, scared the living daylights out of them, they careened off the road, and crashed into a tree and died in a firey inferno. And the engineers that designed the wig-wag thought...maybe that's not such a good idea. How be we just go with a light & a buzzer. So there might be wig-wags. I've only seen a handful them in my time. So most of them will have lights and buzzers. And as I said, 60 or above... it's not uncommon in an airbrake system to see a low air warning come on well above 60 psi. Stop light switch - that just tells you that the brake lights are going to come on when you put your foot on the brake pedal. You don't really need to know what a stoplight switch is - just need to know that during your pre-trip inspection - you need to know that the brake lights are going to come on and you need to check them as part of your pre-trip inspection during your CDL exam and every day when you do a pre-trip inspection on your vehicle. Front brake limiting valve - these are either manual or automatic. Back in the nineteen seventies & nineteen eighties, they were manual - it was simply a switch on the dash that went to dry or slippery. If it was raining out, you put it to slippery or wet. That reduced the braking power to the front wheels by up to fifty percent. Because we want the steer tires to steer, not lock up and lose control of our steering. So this was the old manual ones and you can see an image of one here in the diagram. The new ones are all automatic - 4 5 6. Up to 40 pounds it reduces braking to the front steer axles by fifty percent. Between 40 and 60 is kind of a gradation. After 60 it's equal to the front and the rear brakes of how much braking power there is in terms of the service brakes. Spring brakes, as I talked about earlier—spring brakes are used for both parking and for emergency brakes. And spring brakes are used most commonly as parking brakes. When you park the vehicle you pull out the buttons on the dash & it evacuates the air from the spring brake chambers at the rear of the vehicle. Because we don't have spring brakes on the steer tires. Spring brakes are used for parking and for emergency brakes. In normal applications, the spring brakes are used for parking and they're best used for parking. The spring brakes use all the same linkage in the foundation brakes as the service brakes. The only difference is the power source that applies the brakes. So if the service brake are out of adjustment, the spring brakes are also out of adjustment. That is potentially a question on the test: if the service brake are out of adjustment so too are the spring brakes and if the spring brakes or out of adjustment so too are the emergency brakes because the spring brakes. And the parking brakes and the emergency brakes are one in the same thing. Going up and down the road those large powerful springs are held in the released position by air pressure. If there's a loss of air pressure in the system, the springs will start to come on at 60 pounds per square inch. They actually begin to activate and between 20 and 45 pounds will come on automatically. 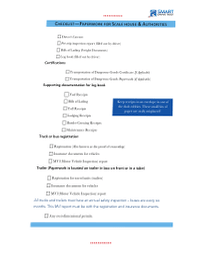 Know that once the low air warning comes on at 60 pounds or above you need to get that vehicle pulled over to a safe place and figure out why you have an air loss. So question for the test: when will the spring brakes apply between 20 and 45 psi is the question on the test that you will be asked. 1) The parking brake control valve which is yellow and four sided you can see here in the image. 2) The other one is the trailer supply valve it supplies air to the trailer and and the engineers actually got that one right. It's red, it's octagon, and it says right on it—unless it's an old truck it will be worn out—but it says right on it trailer supply valve. 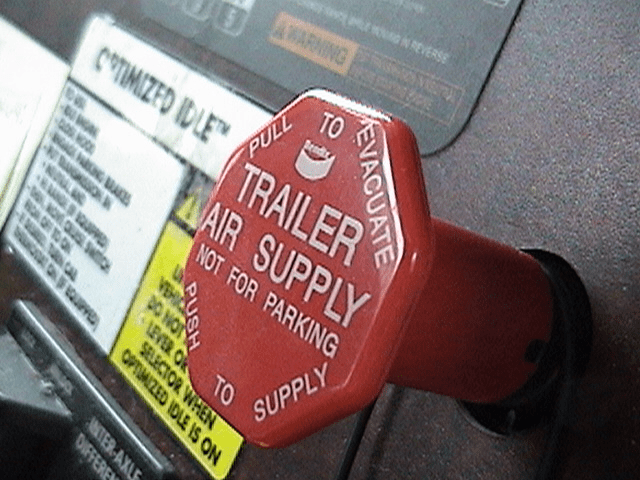 Push the buttons in on a truck to release the parking brakes; pull them out to evacuate the air from the spring brake chambers and apply the parking brakes. Now if you're driving a transit bus it may be reversed. So if you become a transit bus driver, it's going to be reverse because it's not the same setup on a transit bus, as it as it is on coaches and other vehicles. And again in the manual they say here not to compound the brakes, which simply means that you need to release the parking brakes before you put your foot on the service brakes. Now just saying that: don't be afraid to put make a light brake application before you release the parking brakes - that's fine. That's not going to hurt anything as long as it's, you know less than 10 pounds. So just a slight application onto the service brakes. 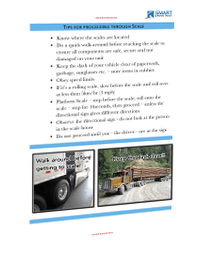 Release the parking brake so the vehicle doesn't roll backwards because when you do your road test in a large commercial vehicle with a manual transmission - know that you can't roll backwards on a start. Otherwise that's an automatic fail. I've never seen one. I teach it in the air a course and all of the modulating control valve tells you is that if you lose air pressure in the system and your vehicle gets stranded on the middle of the road - it's a button that you can use to apply the spring brakes in the same way the service brakes would be applied. And it's for the purposes of getting a vehicle off the road onto the side of the road. The reality is you're not going to find it on an air brake equipped vehicle anymore, but it's in the manual, so you need to know it and that's why they put it in there. Modulating control valve. Some vehicles as they say in the manual here, such as buses, have a separate air tank that is a reserve air tank in the event that you lose your air brakes. You can hold the switch in. It's usually a "deadman" switch, which means you gotta hold it in the whole time and again it's for the purposes of getting your vehicle off the road into a safe place, so you're not stranded on the road and you're not presenting a danger to other traffic. Again never seen one of these. They are in all the manuals. So somewhere in the world they exist, but for the purpose of the road test you simply need to know that it's a "deadman" switch. Dual parking control valve and allows you get your vehicle off the road. Anti-lock braking systems have come into the commercial industry in the last 10-15 years and the same as what happens on cars and light trucks. Instead of making threshold braking and having the wheels lock up, these prevent the wheels locking up and allow you to continue to steer and maintain control of the vehicle. You'll know that the vehicle that you're operating has a ABS on it because when you turn the key to the ON position, wait for a moment for all the check engine lights and the system to do a diagnostic, the ABS light will come on momentarily, and then go out. That tells you that the system is working normally. If the ABS light comes on & stays on, the ABS is not working normally. But this doesn't mean that you don't have brakes. When the ABS fails and that light stays on, the brakes simply revert to normal brakes. So you don't have ABS anymore and you can potentially lock up the wheels. That's how you know you have ABS. I've never seen an ABS system fail. Maybe some of the older ones, but the newer ones I've never seen ABS fail. In some cases the ABS—all of the system's components - the CPU and the sensors in the wheels that detect wheel spin - those types of things will be used for ATC - automatic traction control. So if they detect wheel spin on one side they'll cut power to the motor and direct power to the other side of the truck or bus. ATC uses the same components as the ABS system and the two interact and work together. A couple of other things about ABS that you might need to know. Some older vehicles - the light may not go off until the vehicle gets higher than five miles per hour. So if the light stays on and you get the vehicle rolling & the light goes out, that means that the ABS are working normally. The last thing you need to know about ABS is they are not going to stop you in a shorter distance. It just doesn't happen - so know that if you got ABS they're not going to stop you in a shorter distance. Now if you activate the ABS - you make a hard, firm brake application. Hold the brake pedal down - shuttering, grinding, unusual noises - all that's normal on an ABS equipped vehicle. If you haven't activated ABS before in your vehicle, take your personal vehicle out onto a back side street somewhere, get it up to 20 or 30 miles an hour make a hard, firm, hold the brakes on and get used to what ABS feel like because they're very different than other types of brakes. There's actually grinding, push back, lots of noise and it sounds like the vehicle is coming apart. All of that is normal for ABS brakes. I will give you the answers to the questions on page 5-6. Why must air tanks be drained daily? You must drain air tanks daily to get rid of water and other contaminants in the system to prevent freezing and contamination of the system. This is why your tanks have to be drained daily. The purpose of the supply pressure gauge? It tells you how much air pressure is in the air tanks and it tells you how much pressure you have available for a service brake application. Most service brake application are going to be made at less than 10 pounds per square inch and if you're making a brake application over 20 pounds per square inch you're going to be doing a bug impression on the windshield. So make sure you got your seatbelt on because anything over 10 pounds is an aggressive, hard brake application in an air brake equipped vehicle. All vehicles equipped with air brakes must have a low air warning device - true or false? It is true. Every vehicle equipped with air brakes must have a low air warning device that activates at 60 or above. In this day and age they're all going to be a light and a buzzer. There'll be a light on the dash and a buzzer. You're going to hear it. It's that most annoying sound in the world [ANNOYING BUZZING SOUND] Don't worry - the low air warning goes off, you'll know what it is. Some of the previous airbrake equipped vehicles, back in the old days had wig-wags. It might be a question on the test. About a wig-wag - it was just a arm that came down from behind the visor. Unfortunately it didn't work out so well. A few of them fell down, scared the crap out of a few drivers, they careened off the road, crashed into a tree, and died in a firey Inferno. So the engineers decided that maybe a light in the buzzer would work better. So true! All air brake equipped vehicles have a low air warning device. Springs—large, powerful springs—are used to activate the parking brakes and are best used for parking brakes. They are also used for emergency brakes. While the vehicle is going up and down the road these large, powerful springs are held in the released or caged position with air pressure. If there is loss of air pressure in the system, the spring brakes will come on automatically. If the service brakes are out of adjustment how does this affect the parking brakes or the emergency brakes? Because these large powerful springs use the same linkage as the 'S' cam brakes or commonly referred to as drum brakes or the disc brakes. If those are out of adjustment so too are the parking brakes and the emergency brakes. And that may be a question on the test that you encounter at the DOT office. So spring brakes are used for parking - best use for parking. Also used for emergency brakes. So if there's a loss of air pressure in the system the spring brakes will come on automatically and the low air warning at 60 pounds per square inch is for a very specific reason. Because at that point the spring brakes actually start to activate and this is why you need to get the vehicle off the road and onto a safe place as soon as that low air warning activates. Front wheel brakes are good under all conditions? The answer oddly enough is true. Despite the technology that is applied to the front steer axles to prevent lock up--ABS brakes, front wheel limiting valves, and the fact that there aren't spring brakes on the front steer axle--all of that would lead you to believe that a front wheel lock up is dangerous. When in fact skid pad tests have shown that rear wheel lock up is actually much more dangerous for the driver than steer axle lock up. Therefore, front wheel brakes are actually good because, as we know, on cars and light trucks and other vehicles the front brakes actually do most of the braking. They do 60 to 75, maybe even 80% of the braking in really hard braking situations. And if you got the questions wrong, I too initially got the question wrong, and I would like thank DC Fitness for pointing that out, so that I could make amendments and bring you the best information possible. So front brakes are good under all conditions; the answer is true, but if you’re driving a truck that has a manual front-wheel limiting valve and it’s slippery out, you can put it into the slippery position. Most of the front-wheel limiting valves are automatic and most of the time you’re not even going to know they are there. However, in a hard, hard, hard, super hard brake application—more than 60psi—you’re going to have equal braking to the front steer axles as you will to the back. So, front wheel brakes are good under all conditions – true. Two ways that you're going to know if the vehicle that you're driving is equipped with ABS brakes? First and foremost, you turn the key to the ON position, let the system do its diagnostics check - all the lights will come on on the dash. So you let the check engine light come on. Wait till it goes off and then you can turn the engine ON and start it up. AT the same time the check engine light comes on and goes off, the ABS light will come on momentarily and then go off. On some older systems, the ABS light may come on and stay on until the vehicle attains five miles per hour - then it will go off. The other way that you can tell that your vehicle has ABS brakes is the airline going out to the brake chamber will have an electrical line running along to. It's usually zippy tied to it somehow, but there's an air line and there's an electrical line attached to it as well. So these are the two ways that you know whether your vehicle has ABS brakes, or not. As well, the other question on the test - if the ABS light comes on and stays on do you have brakes? Yes you do have brakes. They revert to normal brakes. The wheels will lock up - you won't have the ABS brakes, but those are the ways that you can tell that you have ABS brakes. The light comes on and stays on - you can still operate the vehicle you just need to take it to a mechanic and get it fixed as soon as possible.